North Carolina is a center in American motorsports, with more than 80% of NASCAR racing teams and related industries located in the Piedmont region. Stock car racing is the official sport of the state. The largest race track in North Carolina is Charlotte Motor Speedway in Concord where the Cup Series holds three major races each year. Richard Petty (Level Cross) and Dale Earnhardt (Kannapolis) were both born in North Carolina and are a great source of pride for Carolinians (both North and South) and Southerners in general. Both men won the NASCAR Cup Series a record 7 times. Earnhardt's son Dale Jr. (also Kannapolis) was the face of NASCAR until his retirement from racing after the 2017 season, and is a sports hero in the Carolinas. Fellow current drivers Brian Vickers (Thomasville), and Scott Riggs (Durham) are also very popular with local fans. Petty's father Lee (passed) and son Kyle (both Randleman) are also very popular. Kyle's son Adam (High Point) was killed when his car crashed during a practice at New Hampshire International Speedway in Loudon, New Hampshire. Outside of the Earnhardt and Petty clans North Carolina is home to many other NASCAR legends such as Junior Johnson (Wilkes County), Richard Childress (Winston-Salem), Ned and Dale Jarrett (both Newton), Andy Petree (Hickory), and Rick Hendrick (Warrenton). As with other sports, college soccer is important in North Carolina. The North Carolina Tar Heels have dominated women's college soccer on a national level, laying claim to the lion's share of all Division I national championships in the sport. The Heels have also been successful in men's soccer, winning national and conference champions. Duke and Wake Forest have also won national soccer championships. In 2011, UNC topped Charlotte in an all-North Carolina affair to claim the men's national championship. In 2008, former Auburn University head swim coach David Marsh arrived to take the helm of USA Swimming's first center of excellence at SwimMAC Carolina (formerly Mecklenburg Aquatic Club) in Charlotte. Under his guidance, SwimMAC has been named USA Swimming's club of the year and is widely regarded as one of the best programs in the country. In 2012, SwimMAC's "Team Elite", personally coached by Marsh, produced five Olympians: Nick Thoman, Micah Lawrence, Kara Lynn Joyce, Davis Tarwater, and Cullen Jones. Many other Team Elite members have made the US National team. Winston-Salem native Kathleen Baker won silver in the Women's 100 meter backstroke and gold in the Women's 4 × 100 meter medley relay at the 2016 Summer Olympics in Rio de Janeiro. 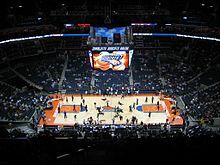 The Greensboro Coliseum Complex is scheduled to open the 78,000 square-foot Greensboro Aquatic Center in August 2011, with seating for 2,500 people. The arena will host the 2012 U.S. Masters Swimming Spring National Championship. This page was last edited on 26 February 2019, at 20:55 (UTC).